BIRMINGHAM – Senior guard Omar Strong of Texas Southern University has been named Southwestern Athletic Conference Player of the Year as announced by the conference on Friday. The conference also released the rest of the 2012-13 superlative winners along with the All-SWAC teams for the season. The All-SWAC basketball teams are voted on exclusively by the league coaches. Strong finished the regular season second in the SWAC in scoring, averaging 17 points per game. He was the SWAC’s top shooter from 3-point range knocking down 120 (3.9 per/game). Strong also led the league in freethrow shooting percentage, hitting 84 percent from the charity stripe. TSU head coach Mike Davis and Southern coach Roman Banks shared Coach of the Year honors after tying in the voting. Davis led the Tigers to a 17-14 record overall and a 16-2 SWAC mark, capturing the conference regular season crown. Meanwhile, Banks led the Jaguars to a 15-3, second place finish in the conference. The Jaguars finished the regular season with an overall record of 21-9. 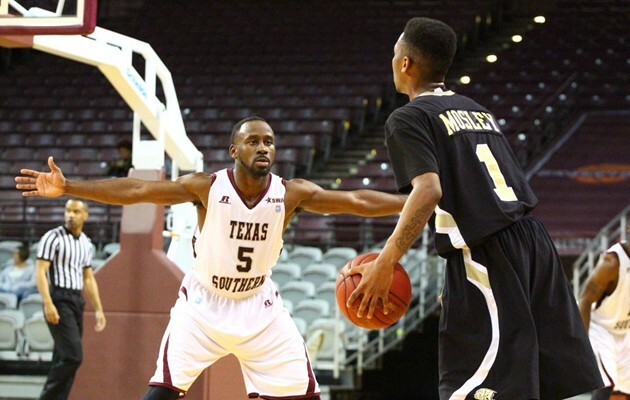 Another TSU standout, forward Fred Sturdivant, was selected SWAC Defensive Player of the Year. Sturdivant led the league in blocked shots with 99 (3.2 per game). He was also ranked first in fieldgoal percentage (.607), second in rebounding (8.2/game) and 19th in scoring with 11.1 per contest. Meanwhile, Southern standout Malcolm Miller was named Newcomer of the Year and Gramnbling first-year player Terry Rose claimed Freshman of the Year honors. Miller was the SWAC’s third leading scorer, averaging 16 points per game. He was also 9th in rebounding (5.8/per game) and 4th in fieldgoal percentage (.521). Rose was a bright spot for Grambling this season, finishing the season ranked 8th in scoring with 13.8 points per game. He was also second in the SWAC in 3-pointers behind Strong with 81 (3/game). Joining Strong, Miller and Sturdivant on the first team is Southern guard Derick Beltran and Arkansas-Pine Bluff center Terrell Kennedy. On the second team are guards Davon Usher of Mississippi Valley State and Jourdan DeMuynck of Prairie View, forwards Demarquelle Tabb of Alabama A&M and Davon Haynes of UAPB and center Phillip Crawford of Alabama State. Rounding out the All-SWAC teams for 2013 are third-teamers Marquiz Baker (G – Alcorn State), Ray Penn (G – TSU), LeAntwan Luckett (F – Alcorn State), Daniel Broughton (F – UAPB) and center Aaron Clayborn from TSU.